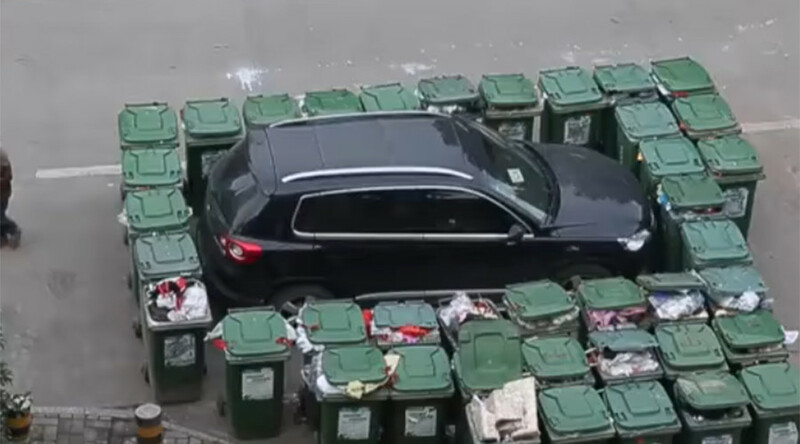 A driver in China may have been in a rush when he blocked a trash collection spot while parking his vehicle, but a ticked-off garbage man wasn’t lazy in wreaking his revenge, surrounding it with dozens of trash cans. In a video that has been gaining popularity online, a furious worker can be seen barricading in a car that was apparently obstructing access to a trash collection point. Unable to get in touch with the thoughtless driver, the enraged garbage man decided to engage in some payback... with some 40 rollout trash bins, according to Chinese outlet People’s Daily, which posted the video. Those seeking retribution against drivers who carelessly park their cars with no regard for others are not uncommon. In Russia, some drivers brazenly park their vehicles wherever they please, blocking pedestrian walkways and trash collecting spots in the process. Some even leave their cars on lawns and children playgrounds. While some avengers opt for paint, nails and, icepicks, others take revenge more craftily, without physically damaging the vehicles.